With spectacular views over the neighbouring cove from its excellent frontline position, Villa Mar Oberta is a valued member of our Very Villa Plus programme. Situated in the area of Cala Egos, Cala D'or, this impressive 4 bedroom house is only a short walk from the beach and facilities of the resort - a great choice for anyone not wanting to hire a car. Air conditioning/heating in the bedrooms and lounge as well as WiFi are included. 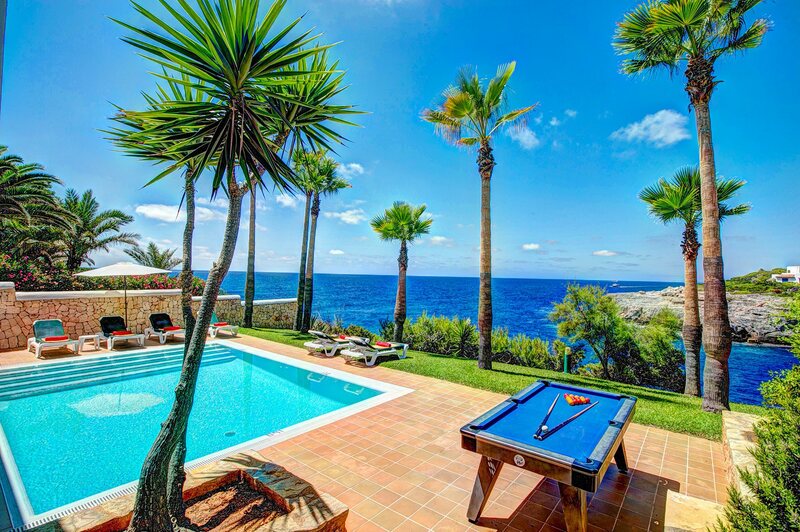 The fantastic sea views and central location make this villa an all-round great choice. The obvious highlight of Villa Mar Oberta is the superb sea view which is best enjoyed from the private pool and sun terrace. On a clear day the remote island of Cabrera can even be seen in the distance. The swimming pool is separated from the rocky seafront by a small lawned garden dotted with exotic palms. The partially covered, raised terrace provides shade for dining alfresco and the brick BBQ is to one side of the garden. The rear of the garden runs parallel with the sea front with no divide. It may be possible for the general public to access and walk along this area of the coastline. The entrance porch to this semi-detached villa is gated from the street, where there is plenty of space to park if you choose to hire a car. The combined lounge and dining area has 2 sets of patio doors opening onto the pool terrace creating a bright and airy living space. The adjacent kitchen is fully equipped with everything you'll need for a comfortable stay, and adjoins to the utility room. The kitchen also has patio doors onto the terrace. The magnificent view over the bay can be enjoyed from the entire living area. To the left of the main entrance, 2 steps lead down to a twin bedroom with a bathroom adjacent and patio doors opening onto the front courtyard. Upstairs, Villa Mar Oberta has 2 more twin bedrooms, one with an en suite shower room, and a double bedroom with en suite shower room. The front twin bedroom has a spacious terrace where spectacular views are at their most glorious. Villa Mar Oberta is ideally located in the area of Cala D'or known as Cala Egos. Within a short walk you'll find the beautiful sandy beach, as well as the choice of shops and restaurants the area has to offer. A much greater choice of shops and places to eat can be found at Cala D'or Marina, 1 mile away, or a little further in the centre of Cala D'or itself. The nearby area of Cala Egos has some fine restaurants, bars and shops, all easily reached on foot. The centre of Cala D'or itself is 2 miles away and has a pleasant pedestrian area with a much larger, diverse choice of restaurants, chic bars and pavement cafes. Whether you're after traditional tapas, a more sophisticated fine dining experience, or just want to enjoy a cocktail or two, you'll find it all here. Villa Mar Oberta is a great choice for beach lovers. As well as the seafront being right at the end of your garden, the beautiful sandy beaches of Cala Egos and Son Pou are both within easy reach on foot. Cala D'or has a number of small but excellent sandy beaches. There are 7 fine sandy bays, each with their own distinctive character, all within a 1 mile radius! Getting out and about around Cala D'or couldn't be easier and children will love the Cala D'or express mini road train, which runs until early evening - a great way of getting to know your bearings and seeing all the different areas within the resort. Cala D'or Marina is definitely worth a visit during your stay. With a number of excellent restaurants overlooking the yachts moored at the waterfront, the marina provides the perfect setting for a light lunch or evening alfresco meal. The nearest golf club is Golf Vall D'or, 7 miles north of Cala D'or. The nearby traditional fishing harbours have been transformed into chic marinas where visitors can come to sail and dive. Villa Mar Oberta is not available to book for 2019 season as it is sold out. Take a look here at the Majorca villas that are currently on sale. Bear witness to the wealth and influence once enjoyed over 200 years ago by the landed gentry. Walk through a sequence of handsome rooms containing fine antique Mallorquin furniture. Being landed gentry, the owners, the "Veri family", had their own live in priest and also a small chapel is established within the main house. Visit the small café where they serve traditional Mallorquin snacks. Sample the island's "Pa-amb-Oli", local bread rubbed with ham and cheese - delicious! Take a stroll around the animal pens which house breeds traditionally used on Mallorquin farms. Located not far from the fishing village of Porto Cristo are the "Cuevas dels Hams" (caves of the fish hooks). The name derives from the shape of some its stalactite formations, particularly in the chamber known as the Angel's Dream which grow in all directions and curve into the shape of fish hooks. In these caves you will discover an underground lake called the Venetian Lake. Western Waterpark offers fun for the whole family. Discover the 'Tornado' where you will be whirled by the power of the water and then thrown down into a swimming pool. Alternatively the children will love the unique adventure of 'Dragoland'. Relax in the 'Congo River' or the big swimming pool. Apart from all this the park has the following facilities: bar, burger shop, pizzeria, cafeteria, photo shop, free parking, taxi and bus service, telephone, sun bathing area, doctor, showers and go-kart racing track. Brilliant views, wonderful setting and very convenient position for bars shops etc. the villa was lovely, best view ever. 8th time at Mar Oberta and hopefully not the last. Beautiful villa, 2nd time we have visited and can't wait to book again for next year! We thought the villa was excellent with fabulous views over the sea. The villa was very well equipped, clean and well maintained. Really recommend it.